We are a beautiful 216 space mobilehome community for seniors at least 55 years of age. The community was built in harmony with the Gold Country hills and native oaks. Spacious streets meander gently around the nearly 36 acres. Strategically located are a park, community gardens, club house, recreation center, aquatic facility with pool and spa, dog park, off- street guest parking, and secure storage area for recreation vehicles. 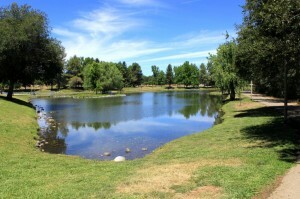 Adjoining our community to the west is the expansive Auburn Regional Park with a lake, tennis courts, soccer and baseball fields, basketball courts, and a Frisbee golf course. There is a vibrant social life in the Rock Creek Community, should you choose to participate. Typical activities include lunch clubs, pot-luck lunches, coffee klatches, pool and poker nights, Bingo, craft groups, card groups. Special events are planned throughout the year; usually around major holidays. Residents own their own homes and lease the home site. The monthly lease payment for a home site ranges from $620 to $700. Natural gas, electric, water, sewer and trash service are billed directly to each home site. Cable television and broadband internet service is available to each home site.